Pharma Web CRM The database of hospitals, outpatient clinics and pharmacies, promotional visits, continuity of service, working time. Pharma Web CRM comprises institutions database. These are hospitals with wards, outpatient clinics with facilities and pharmacies. Many employees can be assigned to every single institution. In case of doctors, their specialties are determined. Pharmacies can additionally be grouped into pharmacy networks. 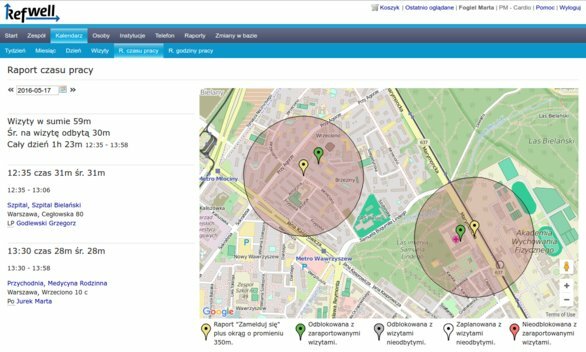 Pharma Web CRM and maps integration allows to easily find areas with highest sales potential. CRM data can be combined with the sales data of IMS Health company. Institutions and people database allows the representatives to quickly schedule their work for the next few days. Refwell System is optimized for the character of medical and pharmaceutical representatives’ work. After each visit, a representative has an opportunity to quickly describe the product, promoted during the visit, state which products is the visited client positive about, what constitutes a barrier to further sale. Promotional visit forms can be customised to your company requirements. Due to full visit history is the good rapport with your company clients possible. The most important clients can be assigned to target lists. Then Pharma Web CRM enables you to define an objective e.g. how often a definite VIP should be visited in a promotional cycle. The supervisor can monitor the data from reported visits on daily basis. He can also check if the whole day was planned appropriately and whether all of the visits took place. Using mobile appliances allows generating high quality reports concerning the working time of representatives. E.g. when the work started, how long one promotional visit lasted on average, how many kilometers the representative covered to get to visited institutions.